With an increasing focus shifting to the craft beer industry, beer wholesalers and distributors are being confronted with the challenge of how to store a growing number of kegs within their space. Kegs are heavy and bulky items that can take up a lot of valuable storage space. This is a particularly important issue when storing items in smaller spaces like coolers. A keg flow system is a gravity racking system that can be outfitted to provide high-density storage for a high volume and variety of kegs SKUs. What type and size of keg do you store? What is the average quantity of SKUs being stored? Does your storage environment require structural racking? How do you replenish inventory once it’s picked? Each keg flow lane can be designed to support first-in, first-out or first-in, last-out inventory management. Separate load and pick aisles are required for a first-in, first-out (FIFO) configuration. Kegs would be loaded from one side and glide to the other side for picking, like a carton flow configuration. First-in, last-out (LIFO) storage can be achieved by configuring the system to have a push back inventory rotation. Each keg would be loaded and unloaded from one side, allowing for more storage density within smaller spaces. Typical specifications for keg flow systems can store up to 8 kegs deep and 8 kegs wide per 96” bay. The kegs sit low in the lane and are guided by side rails that are configured to the height and size of the keg. 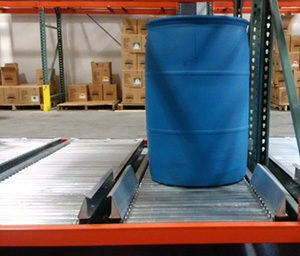 In addition to side rails, keg flow required a high roller stop to prevent the keg from falling forward once it reaches the discharge end of the system. There are several types of keg sizes with varying shapes and weights that could require a higher capacity or heavier duty rollers to support the weight. 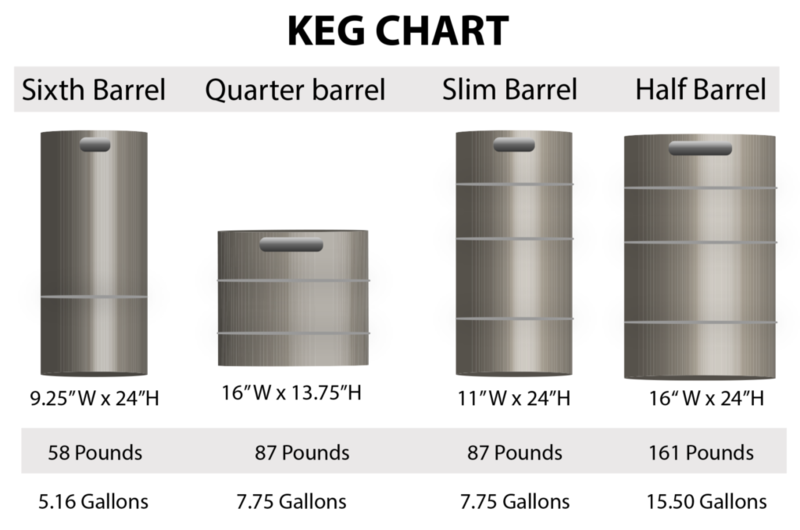 Kegs can weigh anywhere from 58 pounds (sixth barrel keg) to 161 pounds (half barrel, or typical keg size) and can be up to 2 ft high or 17” wide. Lane widths and heights need to be outfitted according to your inventory and the type of kegs you are storing. If your storage requires a cooler environment, structural racking is recommended because it has greater frame strength and durability which allows it to better withstand impact in colder environments. Coolers often have limited space available, so it is imperative to optimize the space with your loading, storing and picking procedures. Keg flow that is outfitted into FIFO systems provide higher selectivity but require more aisles for loading/picking, requiring more space. Keg flow systems that are configured into LIFO systems utilize more space and provide higher density in a limited space. Keg flow racking system designs safeguard inventory while providing a unique storage solution for the growing beer wholesaler and distribution industry. Our goal is to help you better understand your storage needs to maximize your space and optimize your order fulfillment. Fill out the ‘Submit Your Inquiry’ form and we’ll contact you to help you with any further questions or requirements you have.